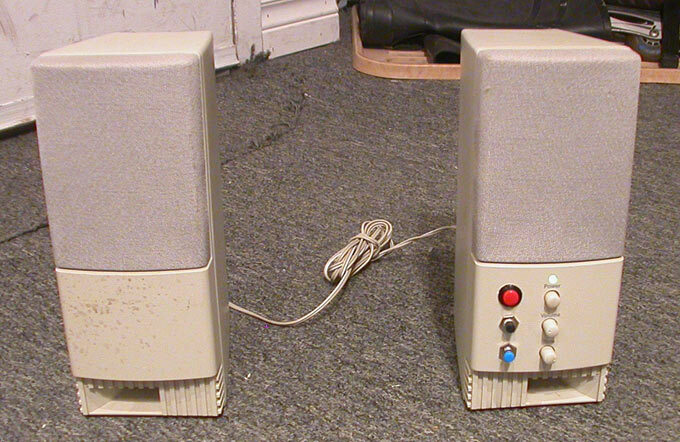 At first glance, these may appear to be a pair of cheap powered computer speakers that may be had at your local computer shop for about $10. Except they usually don't have those colourful buttons. 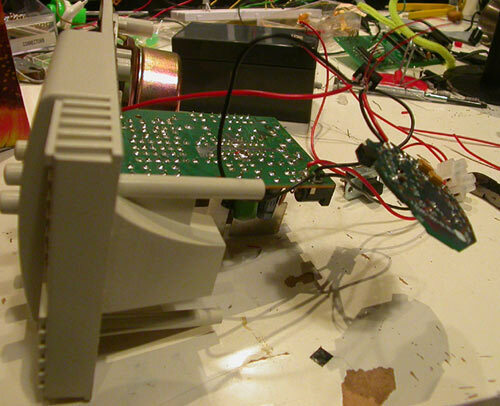 A 12V, 1200mAh sealed lead-acid battery, a stereo bluetooth receiver board, and some switches and wires. What is this? 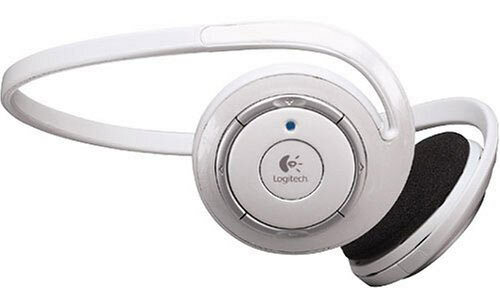 A year or so ago, I picked up a pair of "Logitech Wireless Headphones for iPod" really cheap. I don't own an iPod, so I used them on my regular MP3 player. But these particular headphones had a rather major design flaw: The plastic headband would crack, and then break, causing them not to sit on your head. I now had a rather useless pair. I decided to make the best of the unit. I cracked it open and salvaged the bluetooth control board. Of course, this technology is really new, so the board is impossibly tiny, with all of the components as surface mount. Working on it was a real hassle. 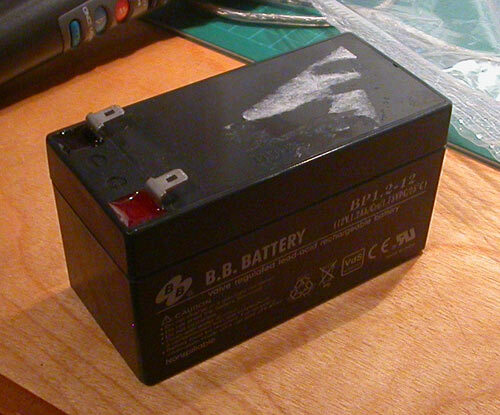 For size comparison: The battery is about 10 cm long. I drilled some holes in the front of the unit and installed three buttons: Power/play/pause, next track, and previous track. These were wired onto the buttons found on the bluetooth control unit. 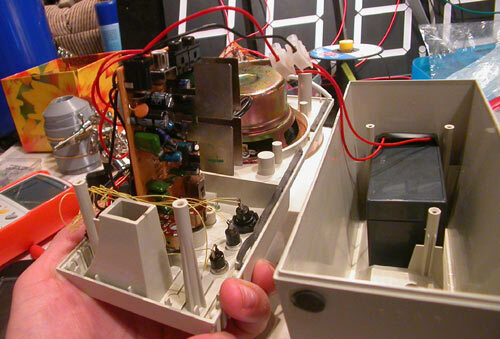 The audio output was wired to the speaker's input. 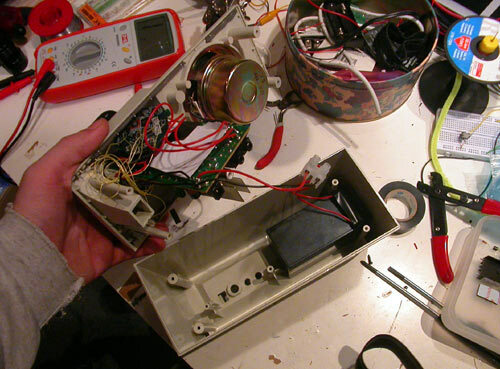 I installed a 7805 voltage regulator off the speaker's power switch, which is wired into the bluetooth module. That means that when the speaker is on, so is the bluetooth unit. 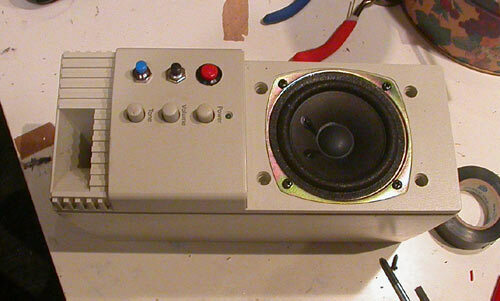 The speaker is standalone, but for extra volume, the second speaker can be connected with a wire. 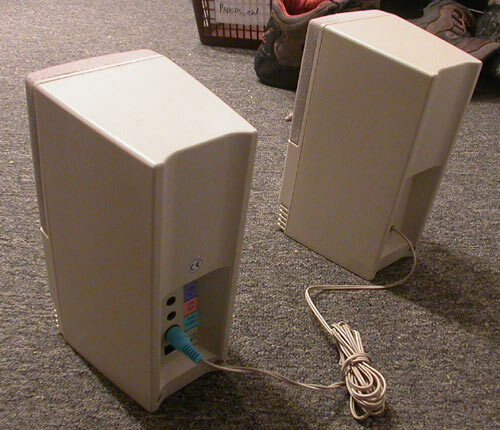 All of the plugs on the back of the box are still accessible, and functional. The power port can be used to charge the internal battery, or to power the speakers if the battery is dead. The line in can be used if you wish to use the speakers as traditional, non-bluetooth speakers. So, in the end, I basically turned a $10 set of speakers, a $10 battery, a $40 set of (broken) headphones, and some assorted spare parts into a fully-functional, powerful 3-watt portable speaker system. According to my measurements, at a moderate volume the battery should withstand the power of both speakers for about 10 hours. At maximum volume, about 2-3 hours. I will be posting some video of the system in action soon! 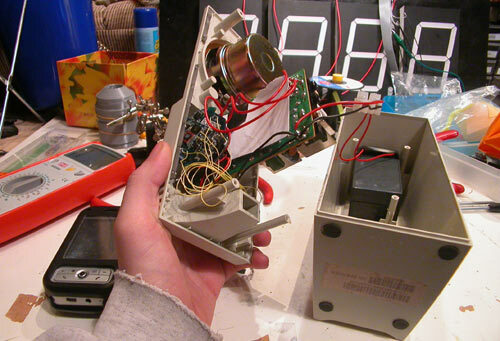 These speakers were built by myself, with Infamy helping with spec'ing the battery, some electronics advice, and removing the impossibly tiny surface mount switches.